Zurich, Wednesday 21 November 2018. 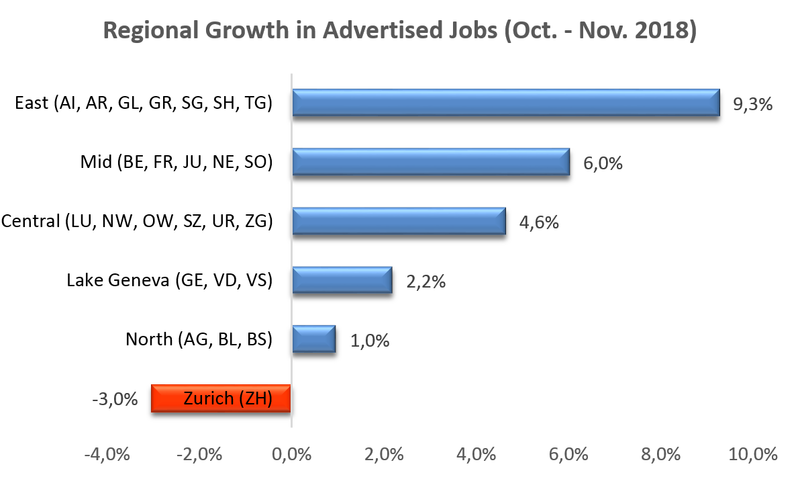 According to the Michael Page Swiss Job Index, the number of advertised job vacancies grew by +3.7% between October and November 2018. This is the highest increase in advertised job vacancies, over this period, since the commencement of the index. The German-speaking region led with +3.9% growth, compared with +2.2% in the Swiss Romande. Growth was principally driven by three regions – the Eastern region with +9.3% growth, followed by the mid region (+6.0%) and the Central region (+4.6%). These regions have a strong focus in the health and life sciences, manufacturing, aviation, defence and logistics industries. According to Nicolai Mikkelsen, Executive Director, Michael Page, “The demand for specialists has reached the stage where top candidates, with the most highly sought-after skills, are receiving multiple offers and being fast-tracked through the recruitment process. This is especially the case for candidates with specialist skills in the pharma and specialist chemical industries, transport, logistics, IT property management and sales”.